Thank you for all the hospitality you extended to me during my recent stay, October 28th to November 1st, 2010. This was my first trip to Bermuda and my first opportunity to operate outside the USA. I appreciate all you did to make my trip a success from securing my operating permit to the airport transfers, you ensured everything went smoothly and I had everything I needed. I found your location has an excellent take-off to the US and a pretty good one to Europe as well. Your antennas all performed well and the accommodations more then met my expectations. 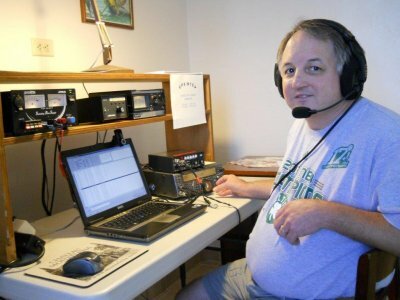 While the major thrust of my trip was operating the 2010 CQWW Phone contest, I also operated some prior to the contest including the WARC bands. This was a real learning experience for me and in hindsight I made a lot of mistakes that affected my final score. While all your antennas worked well, I was particularly impressed Sunday morning when I was able to break a good size pileup to VK6LK on 75m using 100w and the G5RV, a genuine thrill for me! Also the 20m run Sunday afternoon will not be soon forgotten. I have never worked so many stations so fast for so long before, a real adrenaline rush! One of the funny things that sticks in my mind about my trip is that while operating the contest a W4 calls me and tries to give me his report as “59 01”. When I question him as to his location it became immediately apparent that he did not know the correct exchange. And in trying to determine his CQ Zone, I became momentarily confused. No more then five minutes later you walked in with a large CQ zone map and clipped it to the curtain next to me like you had ESP! 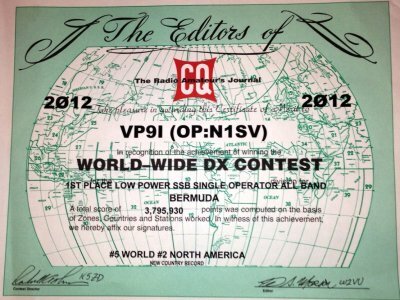 I look forward to returning for the 2011 CQWW Phone contest now that I hopefully know what I’m doing! 1) Almost doubled last years score and came close to the VP9 record for SOABLP in spite of a head cold, I think the VP9I call really helped.